When Ted hears the news that his estranged father, Marty, is dying of lung cancer, he immediately moves back into his childhood home, where a whirlwind of revelations ensues. The browbeating absentee father of his youth is living to make up for lost time, but his health dips drastically whenever his beloved Red Sox lose. And so, with help from a crew of neighborhood old-timers and the lovely Mariana--Marty's Nuyorican grief counselor--Ted orchestrates the illusion of a Sox winning streak, enabling Marty and the Red Sox to reverse the Curse of the Bambino and cruise their way to World Series victory. Well, sort of. 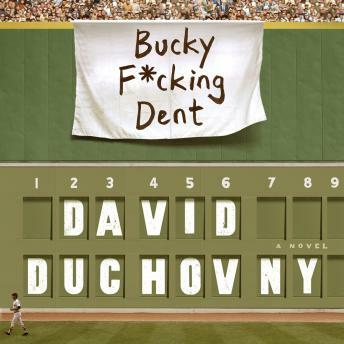 David Duchovny's richly drawn Bucky F*cking Dent is a story of the bond between fathers and sons, Yankee fans and the Fenway faithful, and grapples with the urgent need to find our story in an age of irony and artifice. Culminating in that fateful moment in October of '78 when the meek Bucky Dent hit his way into baseball history with the unlikeliest of home runs, this tragicomic audiobook demonstrates that life truly belongs to the losers--that the long shots are the ones worth betting on. Bucky F*cking Dent is a singular tale that brims with the hilarity, poignancy, and profound solitude of modern life.